The proportion of Republican voters favoring Mr. Carson rose to 23 percent from 6 percent in the previous CBS News poll, which was taken just before the first televised Republican debate in early August. Over that same period, Mr. Trump made modest gains, to 27 percent from 24 percent. In case any of our MSM friends are truly arithmetically challenged, that means that Donald Trump and Ben Carson — two men who have less capacity to fill the office they seek than I do to perform neurosurgery or figure out how to lose money owning a casino — combine to grab half of Republican electorate. One out of every two polled. John: … you said that immmediately, and with some authority. Tyrone: Obama vs. Alan Keyes. Keyes was from out of state, so you can eliminate any established political base; both candidates were black, so you can factor out racism; and Keyes was plainly, obviously, completely crazy. Batshit crazy. Head-trauma crazy. But 27% of the population of Illinois voted for him. They put party identification, personal prejudice, whatever ahead of rational judgement. Hell, even like 5% of Democrats voted for him. That’s crazy behaviour. I think you have to assume a 27% Crazification Factor in any population. Tyrone: Hadn’t thought about it. Let’s split the difference. Half just have worldviews which lead them to disagree with what you consider rationality even though they arrive at their positions through rational means, and the other half are the core of the Crazification — either genuinely crazy; or so woefully misinformed about how the world works, the bases for their decision making is so flawed they may as well be crazy. John: … a bit low, actually. Of course, based on the recent polling gains recorded by our favorite lunatic neurosurgeon, we may be in a situation even the great Kung Fu Monkey has not yet encountered. It’s entirely possible that we could soon see a survey that has both Trump and Carson at 27%. Do we have non-overlapping magisteria of crazy working now in Not-Your-Grandparents’-GOP™? Trump is so thin-skinned that, if he swallowed a flashlight, he’d glow like a Japanese lantern. 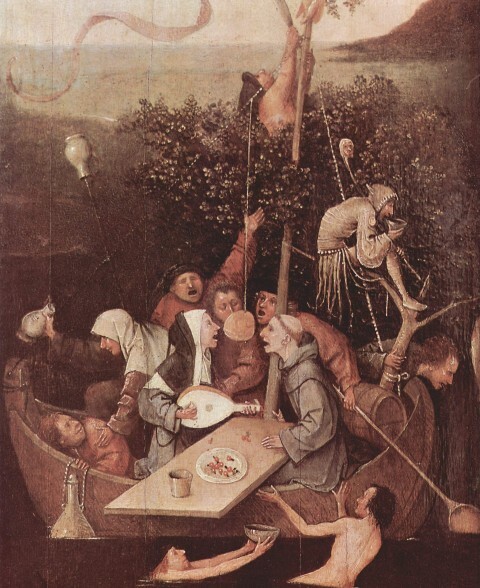 Hieronymous Bosch, Ship of Fools (detail), betw. 1488-1510. (Unsure on the color correction on this one, folks. Been decades since I saw it in the flesh). This entry was posted on September 15, 2015 at 2:01 pm and is filed under political follies, Republican follies, Stupidity, Two Parties -- Not the Same. You can subscribe via RSS 2.0 feed to this post's comments.